Sterling's acrylic paintings incorporate many of the same techniques and theories that he uses in his watercolor paintings. The main difference, however, is that the opaque nature of acrylics allow Sterling to build layer upon layer of paint to achieve rich color combinations. By manipulating the edges of shapes from soft edges to hard edges, he is able to lead the eye through the painting. Combine this with expressive calligraphy, splattering, and lifting techniques, and an expressive painting is born. In this illuminating workshop (April 29 – May 3, 2019), he will share invaluable tips and help students achieve their own goals utilizing some of his proven techniques. Sterling offers daily demonstrations along with plenty of hands-on work and one-on-one critiquing and discussion. Painters at all levels benefit from this five-day workshop. Download our Nearby Accommodations List. The following is a list of recommended materials for the upcoming Acrylic Abstract Workshop with Sterling Edwards. Because of the large number of brand names that are available these days, Sterling suggests that you select colors and manufacturers that you personally like and that coincide with the colors that you enjoy using. For specific items, Sterling has suggested a brand name that he uses and recommends. 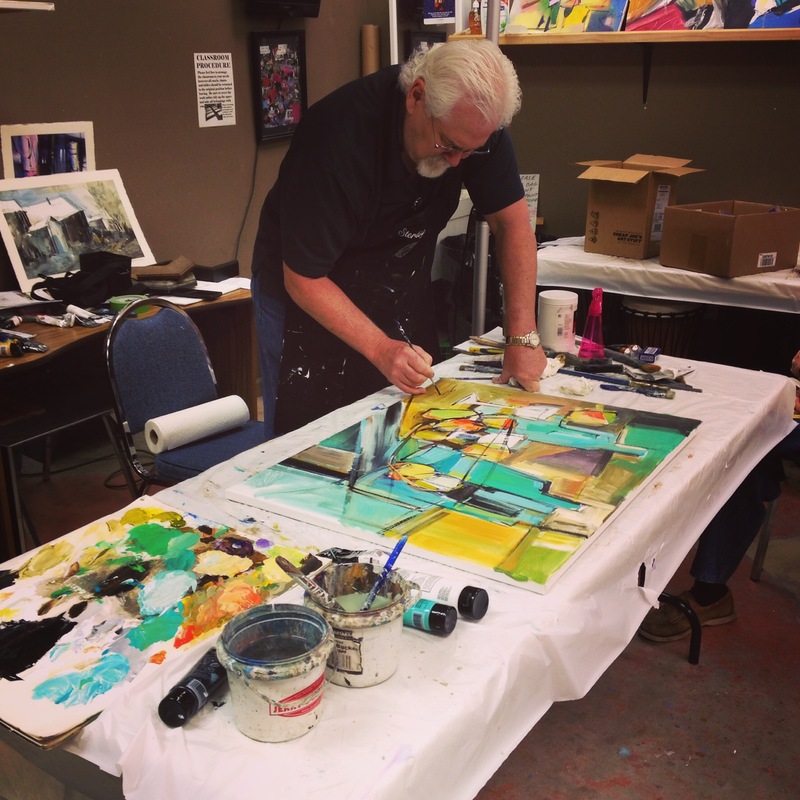 This workshop will focus on showing creative ways to express yours ideas with abstract design and composition rather than everyone using the same colors, brushes, and painting the same piece. Paint. Bring 8 to 12 colors ranging from warm to cool. For example Lemon Yellow as a warm and Prussian Blue as a cool. A good palette would be yellows, oranges, reds, blues, violets, and greens. Bring a large jar or tube of Titanium White and a large jar or tube of Mars Black. Paper and Canvas. Bring several piece of 300lb cold pressed watercolor paper. Sterling prefers Fabriano Artistico, however, any 300lb cold pressed paper will do. If you are going to work on individual sheets of paper be sure and bring a mounting board and masking tape or blue painters tape. Also bring 8 to ten stretched canvases ranging in size from 12”x16” to 18”x24”. Be aware that individual workspace is limited in size. Acrylic Gel. Bring a tub of Acrylic Gloss Gel to extend the drying time of the paint and build texture on the canvas or paper. Sterling prefers Liquitex. Varnish. Bring a jar of Gloss Varnish and Medium to put a finish on your completed painting and also to help keep the paint fluid while painting. Sterling prefers Liquitex. Brushes. Bring a good assortment of oil and acrylic painting brushes in varying sizes of rounds and flats. Sterling will also have his signature Sterling Edwards Blending and Glazing brushes for sale at the workshop. Incidentals. Other items that you will need include: two containers for water, paper towels and tissue, an apron, sketch pad and pencil, eraser, hair drier, a wide assortment of reference photographs such as landscapes, still life, floral, even photos of piles of trash, seriously, piles of trash are great for finding abstract shapes. Bring anything else that you think you might need.